The following Facebook rant is equally as applicable today as it was when I originally posted , possibly more so now. My disappointment about the Americanizing of Tim Hortons continues and is not quelled by its recent purchase by Burger King. This is the second time Tim’s has be acquired by an American fast food chain. Between 1995 and 2005, it was a part of the Wendy’s chain and this December it was purchased by Burger King. It is interesting to note that in the US news articles it is portrayed as Burger King acquiring Tim’s. In Canada it is represented as a merger. Burger King is now a Canadian Company, but who cares. The interesting underlying story to the acquisition is that one of the motivations of Burger King in the deal was to re-designate itself as a Canadian company in order to pay a reduced tax rate in the US. Theoretically, the move makes the new holding company that owns both Burger King and Tim Hortons a Canadian company. But the reality of the situation is the Burger King headquarters is remaining in the US and the CDN designation is purely legal tax evasion. Canada will get no real benefit from the deal. To the contrary, even though the companies say things will stay the same you know it is standard corporate measures to reduce costs and it is hard to imagine that they will avoid eliminating any unnecessary overlap between the companies. Somebody, somewhere is going to loss their job due to the joining of these two companies. Is Tim’s Really the Canadian Icon it Was? Back to the point of this original post, I reiterate that Tim’s is not the company it was when we as a mass of Canadian’s fell in love with it. It has become a soulless corporation that has sold out (twice) while exploiting the blind loyalty of the Canadian public that made it grow to the company it is today. I am repeating myself, I know. To fact check the original post I went into Tim’s and watched the menu screens and sure enough doughnuts do not appear on the menu. Go in and check it yourself. Bottom line is the old Tim’s I knew and loved is gone. It was gone when I did the original post and the sale to Burger King only proves it is never coming back, EVER! And I continue to be addicted and will be back there tomorrow. Thank you Tim’s for making hate myself of loving you, just like every relationship I had in high school. Here’s hoping I get over you faster. 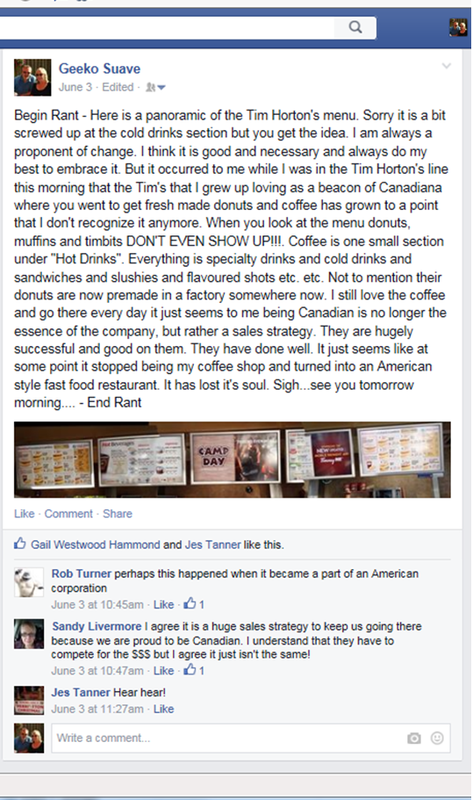 This entry was posted on December 26, 2014 by geekosuave in Facebook Fridays, Rants and tagged Burger King, Tim Hortons.